Viral conjunctivitis is a pink eye contagious type and could be easily transferred from one person to another by sharing common objects life pens, keyboards, phones and other household items. If you are diagnosed with a case of viral conjunctivitis, make sure to sanitize and disinfect all surfaces and wash bedding and clothing in hot water. There’s usually no treatment prescribed for viral conjunctivitis and it clears up on its own within 5-7 days as any viral infection. Bacterial conjunctivitis is another pink eye contagious case and mostly caused by Staphylococcus, Streptococcus bacteria and is especially common in children. An antibiotic topical treatment is commonly prescribed to clear up this bacterial infection. The main characteristic of the bacterial eye infection is thick yellow or green discharge that forms crust on the eyelids. Allergic conjunctivitis is not a “pink eye contagious case” and poses no risk of infection for another individual. 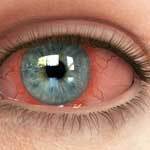 Allergic conjunctivitis is oftentimes caused by substances like pollen, blooming plants and flower, pet dander, dust and cosmetics and usually occurs seasonally. Anti inflammatory and antihistamine combination steroid drops are usually recommended in this case of pink eye. Allergic conjunctivitis is most often seen in both eyes at the same time. Chemical conjunctivitis is not a pink eye contagious type as it is caused by air pollution like smog, factory exhaust and incidental chemical exposure. Various types of pink eye contribute to your bloodshot eyes causes but only some of them are contagious.